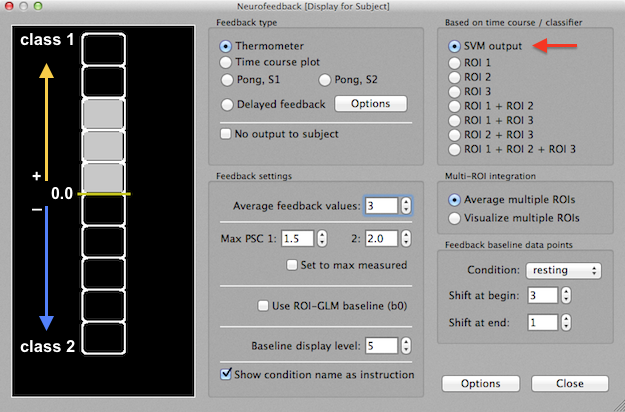 Since version 3.2 of Turbo-BrainVoyager it is possible to use classifier output values directly as input for the thermometer display of the neurofeedback dialog. The SVM output option in the Based on time course / classifier field (see snapshot above) will be available as soon as a SVM classifier is running, i.e. after the Predict button is clicked in the Real-Time SVM Classification dialog. The SVM output option will be available even if no ROI is defined in the main window since the classifier uses its own ROI as defined in a previous learning run. At present only two-class problems should be used for neurofeedback since the used thermometer only represents two directions with gradual positive or negative values. As indicated on the left side in the figure above, positive values indicate prediction of class 1 while negative values indicate prediction of class 2. Value 0.0 is represented in the middle of the thermometer display, output value +1.0 or greater is represented with all 5 upper rectangles filled, and output value -1.0 or smaller is represented with all 5 lower rectangles filled. Intermediate value between 0 and 1.0 and 0 and -1.0 are represented with intermediate fill levels of the thermometer. In case that a multi-class problem is used, the output is always extracted from the first internal class pair previously trained by the classifier. It is recommend to use the TR-by-TR prediction within condition approach in the real-time classifier dialog (default). When using the Trial-by-trial prediction approach instead, only one output value at the end of each trial will be available for neurofeedback (this may be useful as a form of delayed feedback). If multi-class problems are used or if more complex custom calculations are needed, the SVM Access Functions of the plugin interface can be used providing access to all internal pairwise classification results.